Town of North Castle Westchester Co. N.Y. This scarce hand colored map is a lithographic engraving of North Castle, Westchester, New York. 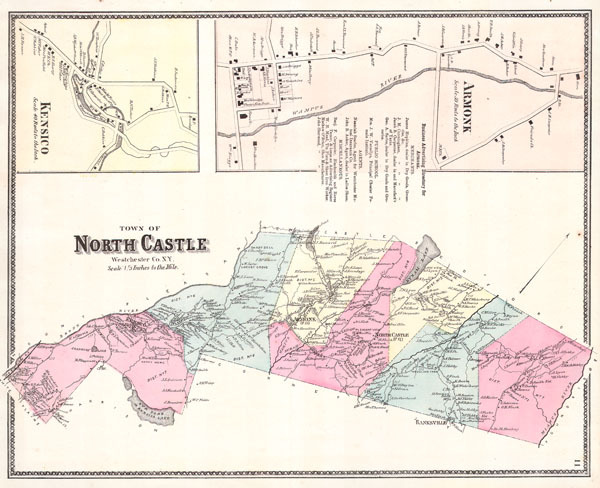 Map depicts the Westchester cities and town surrounding Armonk, North Castle, Banksville, and Kensico. The extraordinary detail of this map, down to individual households with family names, make it a fascinating study for the family researcher or historian. There are inset maps depicting Armonk and Kensico in even greater detail. Also includes other important information such as the Primary Merchants in Armonk, including the names of the town Carpenter, Blacksmith and Horse Tamer!